Windy City Smokeout welcomed more than 40,000 guests to the festival held in Chicago on July 15 – 17. 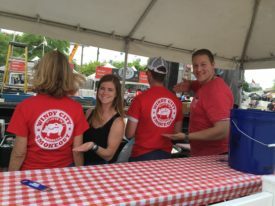 Hosted by Chicago’s favorite BBQ restaurant, Bub City, and ACM award-winning Joe’s Bar, Special Olympics Illinois shared almost 275 volunteers for the event. 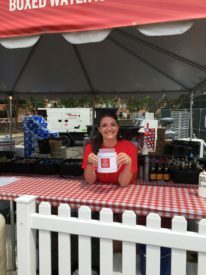 Attendees tasted offerings from some of the best BBQ talent and craft breweries from around the nation. But the highlight for most, was enjoying some of country music’s biggest names. Old Dominion, Billy Currington, Big & Rich, Chase Rice and Maren Morris were among the performers at the weekend festival. Again festival organizers reached out to Special Olympics Illinois for volunteers. Recognizing that Special Olympics Illinois works with enthusiastic, dependable and hard-working volunteers, this was the third year of the volunteer partnership. Bub City and Joe’s Bar placed tip jars throughout the festival announcing that all tips would be donated to Special Olympics Illinois. 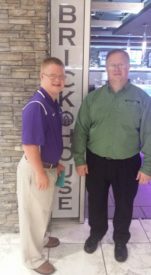 Volunteers each received a restaurant gift card and festival organizers also shared gift cards valued at more than $12,000 to Special Olympics Illinois. Sunshine, volleyball, friends and Special Olympics Illinois – hard to resist! 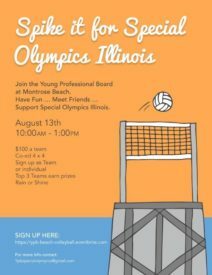 The Special Olympics Illinois Young Professionals Board (YPB) was created in 2005 to raise funds for the Chicago program of Special Olympics Illinois. The board, which includes more than 100 members, meets monthly to discuss and plan opportunities and to host fundraising events. Teams or individuals should register online for the co-ed 4-a-side tournament. Key Volunteers – We Couldn’t Do It Without You! year, she was instrumental in getting our office ready for Spring Games and was on-site for Opening Ceremonies and 4 days of Spring Games competition. She even brought friends to volunteer at our Spring Games this year. Maureen has become not only a volunteer, but a friend we can rely on. 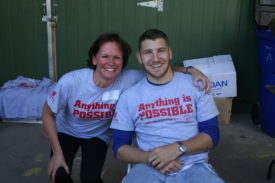 Ian Pearlstein – Ian joined the Area 3 volunteer family in the Spring. He jumped right in, coming in to our office helping us keep on top of filing, paperwork for the various events we had going at the same time and helping us prep for MATP and gymnastics. He was so committed, he came in after an ankle injury in a boot, and came to most of the Spring Games competition days in the last phase of his ankle recovery. He also volunteered at Summer Games this year. At the end of the summer, Ian is heading to Pennsylvania to pursue a law degree. We are sad he’s leaving us, but are hopeful Special Olympics Pennsylvania will gain a new key volunteer! Mari Moore – Mari reached out to our office seeking an internship for college credit. She knew she was going to have free time over the summer and wanted to learn about Special Olympics in a more structured way than just volunteering. She joined our team at the start of summer and has been put to work helping prep for our inaugural Young Athletes culminating events and our softball, tennis and golf events. She’s been a great addition to the team and we will be sorry to see her head back to college in the fall. 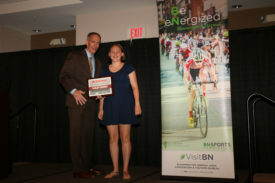 The Bloomington-Normal Area Sports Commission hosted the 9th annual State Farm Student-Athlete Recognition Banquet on June 21 at the Holiday Inn & Suites in Bloomington. The banquet recognized outstanding scholar athletes, coaches, teams, and others in McLean County for their achievements on and off the field. 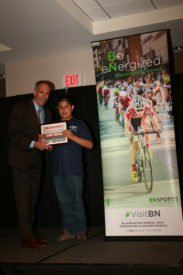 The banquet featured a speech by Special Olympics Illinois Global Messenger Drew White. Special Olympics Illinois Heartland/Area 6 and the Law Enforcement Torch Run are hosting a Lip Sync Battle on Aug. 11. This inaugural event will feature Central Illinois celebrities who will “sing” their hearts out against other local celebrities to raise money and awareness for our Area 6 athletes and their families. Lip Sync contestants will perform to one of their favorite songs for the audience, who will in turn vote for their favorite acts with a donation. They are encouraged to wear costumes and can invite friends or family to be their backup singers/dancers! In addition, Best Costume and “Keep Your Day Job” awards will be presented. The Lip Sync Battle will be held from 6 to 9 p.m. Aug. 11 at Mackinaw Valley Vineyard. The Vineyard will be selling its wine and beer selections throughout the evening. Tickets are $20 per person and can be purchased online. For more information please contact Mollie Knutson or Jordan Vose. For many high school seniors and juniors, the thoughts of “what comes after high school?” occur often, and Jimmy Peterlich of Charleston High School is no different from his peers in that he too is considering his future endeavors. At his home, Jimmy often would create and write restaurant menus, which steadily grew to a passion for owning and managing a restaurant someday. Thanks to his family and some legislative support, Jimmy’s dream of learning restaurant management and working with customers was more of a reality on his horizon than expected. In April, Jimmy and several other Global Messengers and Family Ambassadors attended the Special Olympics Illinois Capitol Day in Springfield to help raise awareness for individuals with special needs and their abilities to thrive, make friendships, be involved with their communities, learn sports, and compete like other athletes. Jimmy, a gold medal winner in basketball, athletics (track & field) and bowling, has been serving as a liaison and Global Messenger for SOILL since his early childhood. The City of Crystal Lake has recognized Brent Kampert, Special Olympics Illinois athlete and Global Messenger, for his athletic achievement in Special Olympics. Brent competed in the 2016 Special Olympics Illinois State Summer Games where he took first place in both the long jump and 100-meter run. Crystal Lake, like many cities, offers a Championship Signs Program that recognizes individuals or teams from the community who have won State championships. 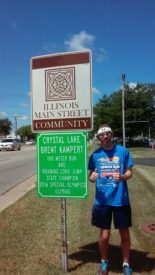 They awarded Brent with several signs placed around Central High School where he graduated high school and along Route 14 throughout Crystal Lake. These signs will be up for one year. Congratulations to Brent Kampert on his accomplishments! Thank you to Crystal Lake for supporting Special Olympics Illinois.